After stints on Wall Street and as CEO of his own startup, García Martínez joined Facebook’s nascent advertising team, turning its users’ data into profit for COO Sheryl Sandberg and chairman and CEO Mark “Zuck” Zuckerberg. Forced out in the wake of an internal product war over the future of the company’s monetization strategy, García Martínez eventually landed at rival Twitter. He also fathered two children with a woman he barely knew, committed lewd acts and brewed illegal beer on the Facebook campus (accidentally flooding Zuckerberg’s desk), lived on a sailboat, raced sport cars on the 101, and enthusiastically pursued the life of an overpaid Silicon Valley wastrel. 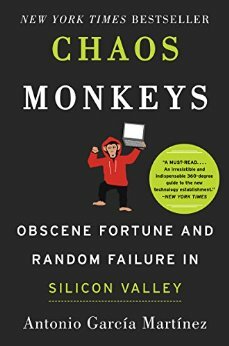 This entry was posted in Books and tagged antonio martinez, chaos monkeys, facebook, silicon valley, twitter. Bookmark the permalink.